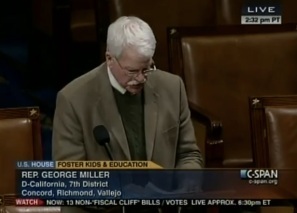 2013 began with both houses of Congress passing a key bill that will improve foster youths education. If signed by the President, Uninterrupted Scholars will amend the Family Educational Rights and Privacy Act (FERPA) to allow child welfare agencies access to foster student records. When FERPA was written in 1974, lawmakers' intended to protect parents' control over their children's student records. There was an unintended consequence for those children whose parent is the state. Legal red tape made huge hurdles for social workers to jump for access to foster student records. Jetanie Hart, a former foster youth who now works as an educational mentor for foster youth said, "Slowed access to student records for child welfare agencies means missed opportunities to celebrate a foster child's academic success or to help overcome educational challenges." This bill will give real time assessment of a students grades and disciplinary action. Allowing them to make better decisions about the educational needs of the kids. Further, lawmakers and advocates argue that the new law will help foster youth who transition to many different schools. Almost two thirds of former foster youth experienced seven or more school move from kindergarten to twelfth grade. This often results in unnecessary loss of school credits, which contributes to a foster youth low graduation rate of 50, according to data compiled by the National Working Group on Foster Care and Education.